When my family first moved overseas in 2002, we had much to buy. We brought clothing, toys, bedding, and a few other essentials with us, and then spent weeks shopping for furniture, appliances, dishes, and everything else. By the time we had most of what we needed, I was shopped out! One of the little things we could have easily brought with us but didn’t was an alarm clock. It never crossed my mind to tell you the truth so we added alarm clock to the list of stuff we needed to purchase. We looked everywhere for one, and finally found one at a mall department store. It was a little, plastic, battery-operated Casio alarm clock that would have sold in the states for less than $10. This one. It was in a glass case with other clocks and watches. I told the gentleman behind the counter that I wanted to buy it, and he informed me that it was approximately $25. What??? Ok. Well, I needed an alarm clock so I told him I would take it. He filled out a ticket, filled out the warranty information, had me sign the paperwork, and told me that I had to pay for the clock at a register up front before he could give it to me. Wow! Ok. I paid for the clock and took my ticket back to the watch/clock counter to pick it up. 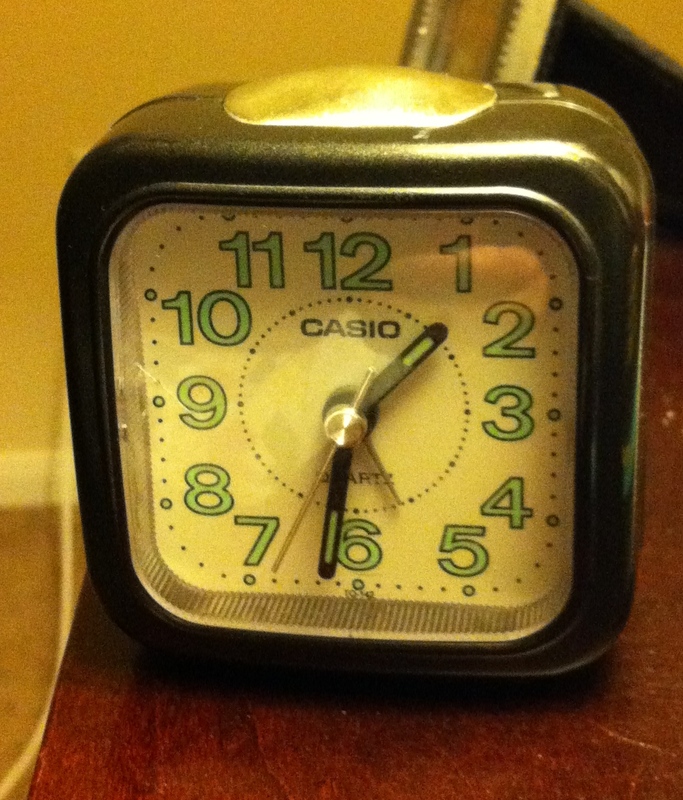 It was so formal and fancy…for a little Casio alarm clock with a button for a light but no snooze. Well, I brought that little alarm clock back to the states with me when we moved back in 2008. I took that clock when I moved into my own apartment in 2009 and then to the house I bought in 2011. I’ve used that little alarm clock for the last 11 years. It was such a big deal to buy it that it made it more special. The little knob that sets the time has grown somewhat cantankerous after so much use. Over the last 4 years, anytime I’ve needed to change the time, I’ve had to use much care and love to get the knob to catch and turn the hands. I was able to set the clock back in November when daylight savings time ended, but yesterday when I noticed that the clock was 5 minutes slow I couldn’t get the knob to turn. I messed around with it and never could get it to work. 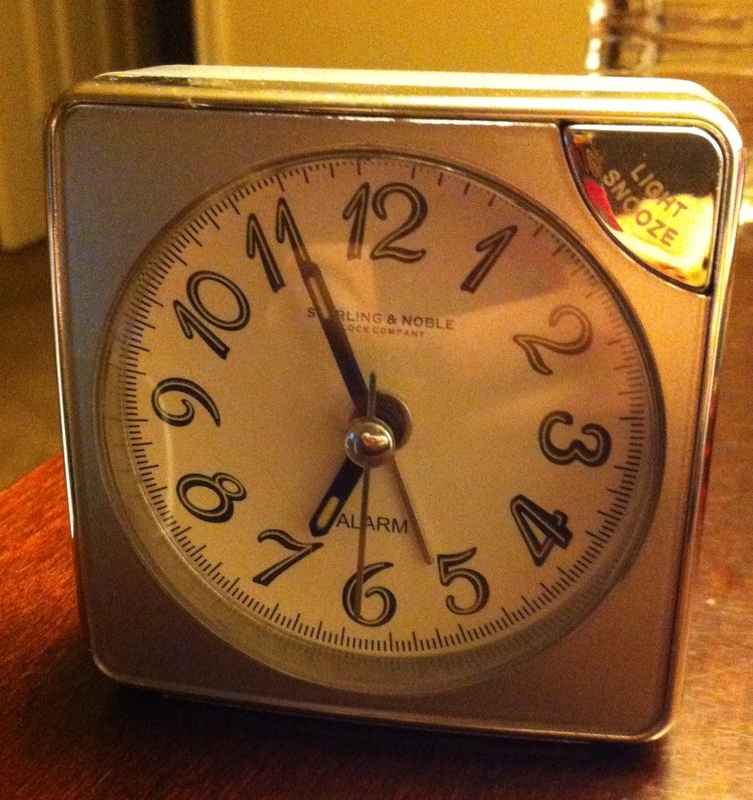 I decided it wasn’t a big deal to be 5 minutes slow and put the clock back on the nightstand. This afternoon I noticed the clock was missing. The dog often gets on the bed and inspects the nightstand, looking for used tissues to tear up, mostly empty water bottles to play with, or chapstick tubes to chew, so I figured she had knocked the clock off. I found the clock under the bed with the above time on it. It was 5:30. I have no idea how the time changed so drastically, but nothing I did to that clock fixed it. I had finally resigned myself to the death of that little alarm clock. Silly and sad at the same time. A couple of years ago I thought the little clock had given out so I bought this clock to replace it. It has a button for a light AND a snooze, but it’s just not the same. I picked it up off a shelf at Walmart and paid $6 for it. There was no warranty paperwork filled out with my name on it or fancy glass counters with salesmen making sure I paid before I received the product. I used it for a couple of weeks, but I didn’t like it. The faint ticking sound was different than what I was used to hearing. The alarm, while similar in rhythm, had a slightly different tone. The little Casio was in a drawer so I pulled it out and my girlfriend was able to get the knob to turn. I put the new clock away and haven’t thought much about it since. Today, I pulled the new clock out of the drawer. I guess it’s not really a new clock anymore. And I just stared at it. And then I came up with the most brilliant plan! I’m gonna take the battery out of the little Casio alarm clock. I’ll set that new clock’s alarm for the exact time the Casio’s hands are positioned, and when it goes off I’ll put the battery back in the Casio and the time will be right! Sheer genius I tell you!